Tiny Toes in SoCal Sand: Strong B Reads His First Book! Strong B Reads His First Book! I don't know if most people are like this...but I find that ever since becoming a stay-at-home mom/homeschooling mom, I'm constantly evaluating the different facets of our lives, and figuring out if we are truly doing what is best for us. When I'm in more of "survival mode," such as when we have illness or Tiny B is having a migraine episode, during holidays, or just rough times, I don't think of these things as much. But when things are relatively good, I find myself questioning things. I've been doing that quite a bit this week about a few things, and one of those things is how to do the day to day learning with Strong B. His needs are different than Tiny B's. While she was willing and wanting to sit for long periods of time doing school work in preschool, he is not. I'm finding that he asks me writing and reading and math questions while he is playing something that is totally unrelated. Usually it's while he's outside being very physical. Interesting, right? Mother Goose Time is looking different with him this year. Tiny B is mostly doing her curriculum from her charter school. On the days when she is at school, Strong B wants to get out of the house and play. He wants to wait to do Mother Goose Time with her. He just really enjoys her. And when he's alone, he wants OUT. So, that's what we've been doing. I had planned on doing MGT with him while she is at school, but waiting for her is just as well. She loves the activities and I'm finding that many of her kindergarten objectives are practiced within this beautiful curriculum. She does NOT like to hear that we have done MGT without her...so for now, we will wait for our sweet girl and we will run outside and play hard. Until that changes of course, which could be tomorrow, but for now, we play. 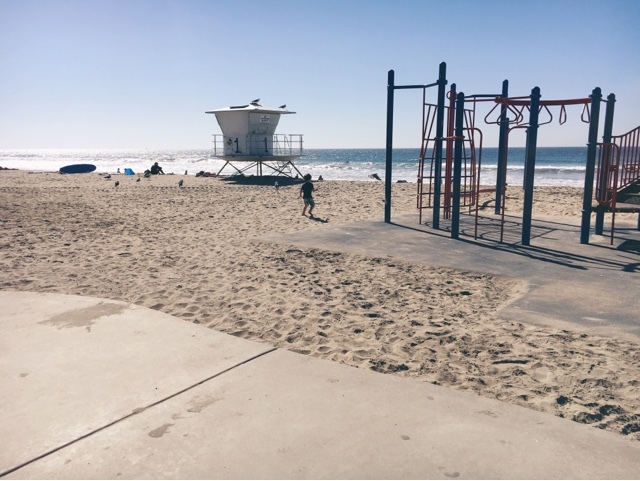 This week we went to the beach and Strong B ran and ran and ran and chased Seagulls and begged for Halloween candy and gum. Both of which I obliged. These times will not be forgotten by either of us. 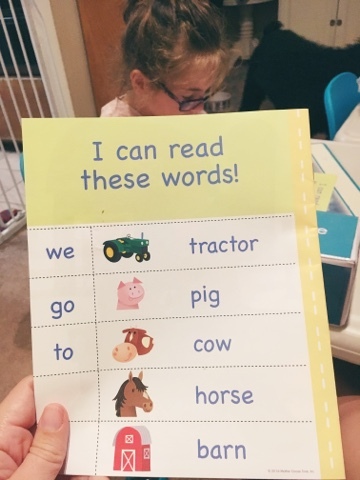 Homeschooling a preschooler is a magical time. One night this week we pulled out the Tractor lesson. We've been waiting for a special time with this one because we call grandpa "Tractor Grandpa" because he drives a tractor. One of the lessons for the day used an I Can Read book which is one of my most favorite parts of this curriculum, and I'll show you why. We started with a bit of discussion about tractors. I did not do the "Explore" part of the lesson because I had hoped at the time to do two of the lessons for the day that evening. 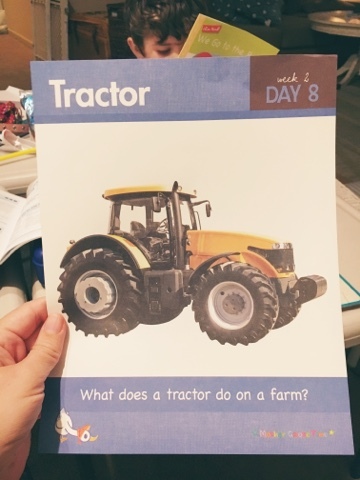 It turns out that I only finished this lesson because they loved it so much and we ended up calling Tractor Grandma to have Strong B read his very first book ever to her!!! It's an adorable paper book with bright colors. 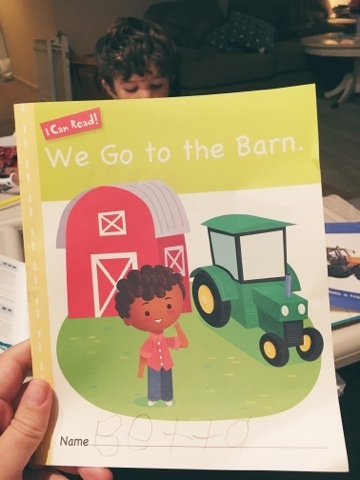 When we called Tractor Grandma, she asked me (without him knowing) if he really was reading. The answer was yes and no. 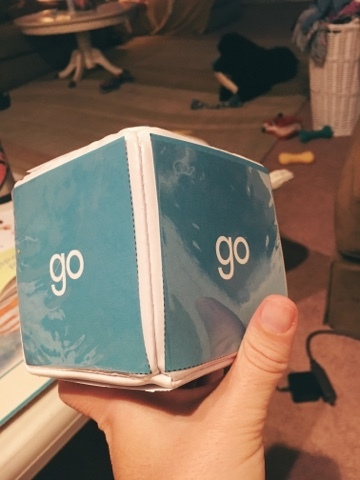 You can see that the only words that they truly need to know how to read are "we", "go", and "to." 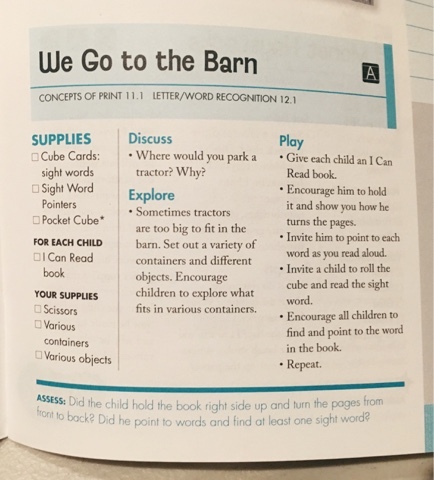 They can figure out the other words because the page has a picture that goes with the word. I love this SO MUCH because it builds such confidence! I wish that I could show you a picture of Strong B's face as he read the book. I took pictures but since I don't show full faces here, I can't show you, but I can tell you that it was beautiful! He practiced reading from left to right, turning the pages, identifying a cover page and title, using picture cues for meaning, and comprehension when we discussed the story! And he learned three sight words that he truly did read! We played a game described in the lesson, where they had to roll the cube and find the sight word that was written. That is an excellent teaching tool. He practiced tracking the words with his finger. This was adorable...Tiny B has been learning how to "butter" her popcorn words (sight words) with a yellow marker, so she taught him how to do it, and he wanted to butter everything. That was fine by me! What I'm learning is that my two children are different, and that he is going to learn differently than her. I'm trying to break out of my classroom teacher mold and this is the hardest part. 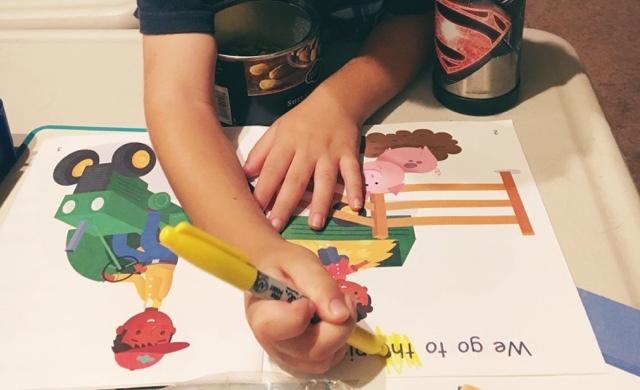 Homeschooling just looks different, and that's okay. I want Strong B to love learning like his sister does, and I'm seeing that listening to his educational needs will lead us to the same destination, of the love of learning, even though we might take several different paths.